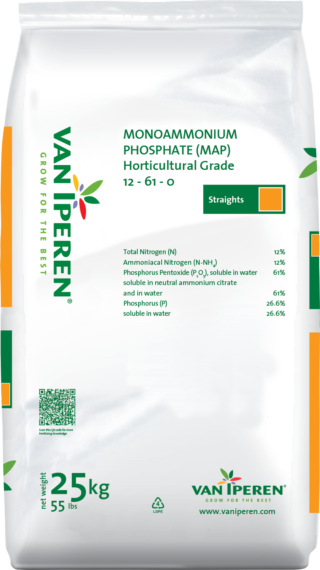 Van Iperen Monoammonium Phosphate (MAP) Horticultural Grade is a highly pure Phosphate fertilizer which dissolves rapidly and completely. Our product has a limited caking sensitivity and is recommended during root and shoot development. The high level of Phosphate in our formula increases cell division and development of new plant tissue. The presence of Nitrogen has a positive effect on the uptake of Phosphate in the plant. Compatible with other fertilizers, with the exception of Calcium fertilizers. Therefore a separate tank is needed or fertilizers should be applied on different times.